Aerobic vs. Anaerobic Exercise: Which Is Best to Burn More Fat? Modern exercise science shows that all exercise is not created equal. Depending on your goals and body type, there are some approaches that may yield better results for you than others. In other words, it's no longer as simple as inputs and outputs. So if your goal is to lose weight, this begs the question—what is the best exercise to burn fat? While not a simple answer, a look into aerobic versus anaerobic exercise could help shed some light on how to approach your workouts. More: What's Ruining Your Weight-Loss Goals? There are several ways that the terms aerobic and anaerobic exercise get tossed around. The more formal definitions of the two revolve around the level of oxygen consumption needed to perform a given activity. During aerobic exercise there is sufficient oxygen intake needed to sustain the current level of activity without using additional energy from another energy source. During anaerobic exercise, oxygen consumption is not sufficient to supply the energy demands being placed on your muscles. Therefore your muscles begin to break down sugars, resulting in higher lactic acid production. However, there is a simpler way to differentiate the two. Aerobic exercise is light activity you can sustain over long periods of time, such as jogging. Anaerobic activity is bursts of activity for short periods of time, such as sprinting. And guess what? Both types of exercise burn fat. Both boost the metabolism that will last for hours after the workout. The key to getting the best results is to have a workout that incorporates both. Aerobic exercise increases your endurance and cardiac health while anaerobic exercise will not only help you burn fat but also help you gain lean muscle mass. Many group classes, like Jazzercise, incorporate both exercises. Aerobic and anaerobic segments are placed in perfect balance to give you maximum fat burning benefits. Each Jazzercise class has choreographed movements that burn fat aerobically and build lean muscle anaerobically. All the exercises are carefully designed and choreographed to music to achieve these goals. The tempo of the music along with the style of the moves affects heart rate. The cardio portion of class is an excellent form of aerobic exercise while the strength training is anaerobic and will help you develop lean muscle that burns more fat. Stay in shape in a fitness class. Judi Sheppard Missett, who turned her love of jazz dance into a worldwide dance exercise phenomenon, founded the Jazzercise dance fitness program in 1969. Today the program boasts more than 7,800 instructors teaching more than 32,000 classes weekly in all 50 states and 32 countries. 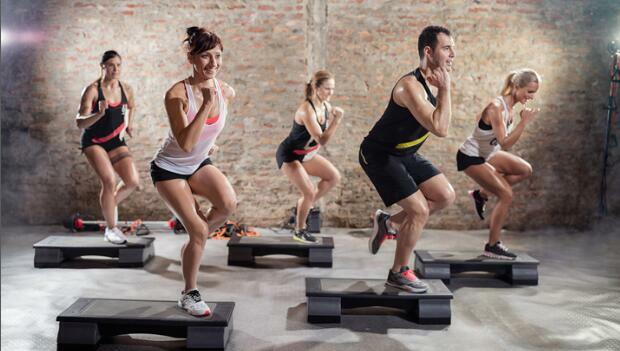 The workout program, which offers a fusion of jazz dance, resistance training, Pilates, yoga and cardio box movements, has positively affected millions of people. Benefits include increased cardiovascular endurance, strength and flexibility, as well as an overall "feel good" factor. For more information go to jazzercise.com or call (800) FIT-IS-IT. Should You Work Out Twice a Day?